A ceramic coated exhaust turnout pipe that little curved bit of pipe directs hot exhaust away from rear platform. 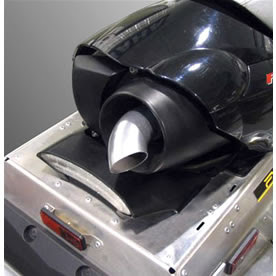 If you store gas cans or storage bags at the rear of your snowmobile this turnout protects your belongings against the heat coming out of the exhaust pipe. When shopping our snowmobile accessories select the year and model of your snowmobile to view a complete list of genuine Yamaha accessories that custom fit your machine.View Yamaha snowmobile parts and microfiche on our our Yamaha parts pages.